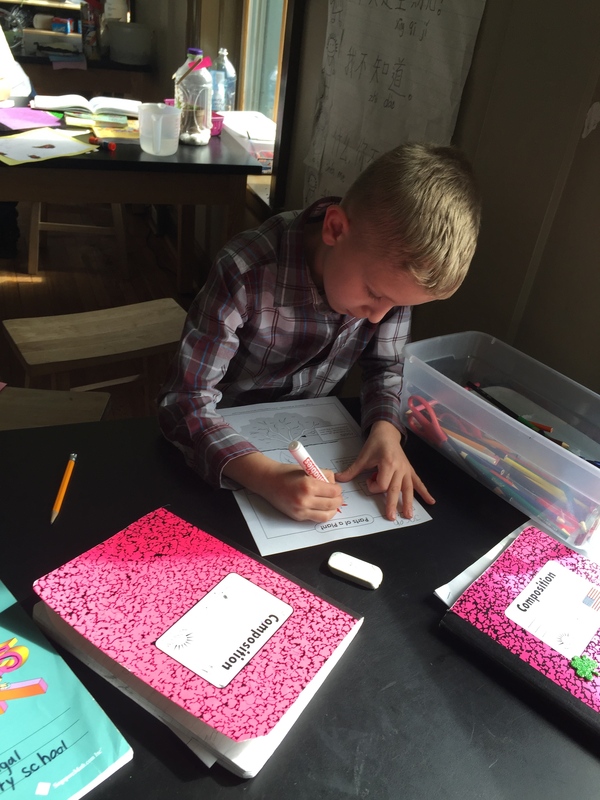 Lower elementary students are also given regular writing sessions. This student gets right down to it! Although The New Century School was abuzz in March with all things STEM Fair related, Language Arts hardly suffered! Amidst the science- and engineering-oriented preparations, projects, and presentations, TNCS upper elementary students were busily working on their Informational Writing pieces. Language Arts teacher Adriana DuPrau follows the renowned Lucy Calkins writing curriculum, as recently detailed in “State-of-the-Science Elementary Writing Instruction at TNCS.” For this phase of the curriculum, Mrs. Duprau challenged her students to choose a topic they wanted to educate others about and then to elaborate on the topic in a 1- to 2-page cohesive document. They worked on their pieces in “writing workshops.” During most of this time, students wrote independently, with Mrs. DuPrau conferring and guiding as needed. What emerges during these workshops becomes a “mini-lesson,” in which the teacher offers strategies for writing that the student will be able to apply in other writing contexts and in this way continuously cultivate effective writing and communication skills. “Topics ranged from the Baltimore Ravens to immigrant families,” said Mrs. DuPrau. Her students also presented their pieces to the rest of the class, giving them some important practice in the art of public speaking and boosting their self-confidence in the bargain. (See a slide show of these wonderfully self-possessed presenters below.) Also of note is that the students provided an accompanying illustration, which served both to help convey the idea they were elaborating on as well as to make the topic richer for their own exploration of it. Arts integration has been receiving lots of media attention recently, but this innovative approach to education is nothing new to TNCS! Everything you ever wanted to know about Joe and the gang is contained herein! Dunkleosteus—wow! Never heard of it until now! Also just in time for the STEM Fair! There was lots of seed planting and nurturing going on at TNCS this spring! Informational Writing is the age-appropriate curriculum for 3rd- through 5th-graders, but all TNCS elementary students are given writing instruction and ample opportunities to express themselves in writing, right down to kindergarteners. 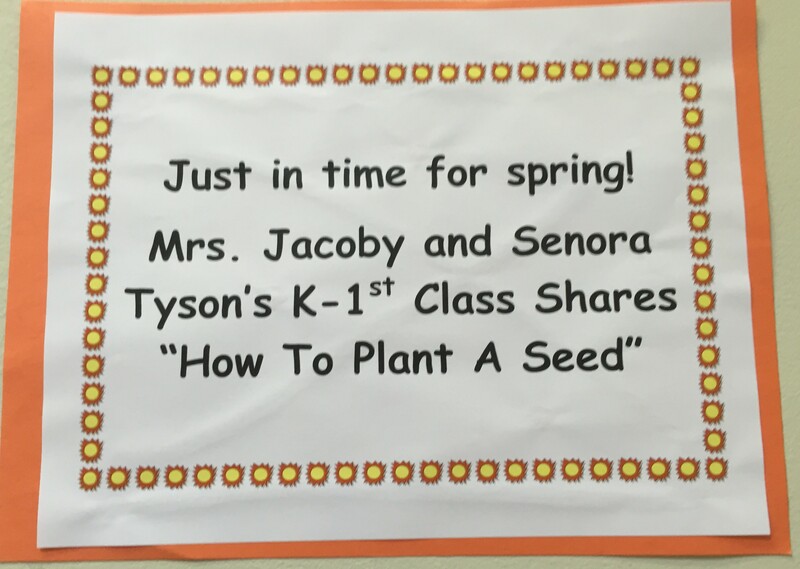 Teresa Jacoby’s K/1st students, for example, also participated in a writing project that took the form of a How-To. Students were asked to explain in stepwise fashion how to approach a given task, such as making a PB&J or planting a seed. These writing pieces, too, were accompanied by illustrations. Mrs. Jacoby provided a helpful how to How-To for her students. As this illustration clearly shows, it takes a village. Note the very effective use of transition words! Writing in the classroom is an integral part of learning, helping students to communicate effectively; to review and remember recently learned content; to be creative and explore a topic deeply; and to better understand their experiences and, by extension, themselves. Write on, TNCS elementary students! We eagerly await all that you have to express! TNCS STEM Fair 2015 Makes a Huge Splash! The past week at The New Century School was devoted to the STEM (science, technology, engineering, and math) Fair, and what an exciting, inquiry-filled week it was! This year’s was the biggest ever, with three classrooms participating—Dan McGonigal’s upper elementary students, Adriana Duprau’s lower elementary students, and even Teresa Jacoby’s K/1st students—each class taking a slightly different approach to their projects, but all loosely unified by the common theme of water. Mr. McGonigal took the lead on this endeavor, as appropriate, given his specialization in this area. You may recall from a Meet the Teacher post last fall that he is part of the very first cohort in a pilot program at Towson University for STEM certification to earn the new Maryland State Department of Education endorsement, “Instructional Leader—STEM (Pre K‑6)” this spring. He is passionate about the value of STEM teaching and with good reason. 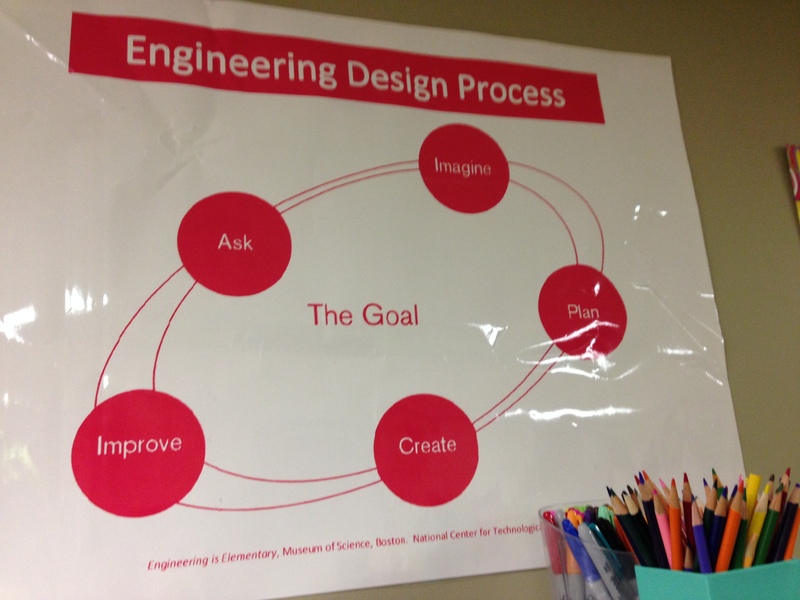 “STEM is an integrated instructional strategy—there are no borders or boundaries,” he said by way of introduction. STEM pursuits will ensure that students develop “21st-century skills”—those skills they need to navigate this exciting new era of globalization, connectivity, and continuous technological advancement. According to the Partnership for 21st Century Skills, these skills include “critical thinking, problem solving, communication, and collaboration,” which intersect with social and media literacy, among other critical disciplines. You will see how these features were implemented throughout the TNCS Stem Fair projects as well as how they employed their engineering mantra: Imagine, Plan, Create, Improve, and Ask. Mrs. Duprau’s first- and second-graders presented their Life Cycle of a Plant projects on the following day inside the TNCS gymnasium. Their presentations took the more traditional approach with the trifold poster boards used by science fair presenters for decades. Note that these persistent, hard-working students took the “improve” part of the engineering design mantra very much to heart—be prepared to discreetly cover your inevitable chuckles if the kids are nearby. Scientists have feelings, too ;)! Finally, on STEM Fair Day 3, Mrs. Jacoby’s kindergarteners and first-graders took over the stage. Not yet being the consummate presenters that their older colleagues are, they used a video directed and produced by Mrs. Jacoby and Señora Tyson to debut their work (there wasn’t a dry eye in the audience; the video is wonderful). Parents were then asked to direct specific questions to the students about their projects. Although this was the first year that kindergarteners participated in the STEM Fair, you will see that they held their own amazingly well! Thank you to Mr. McGonigal and the other TNCS teachers who made this STEM Fair such an unqualified success! We are already excited for STEM Fair 2016! 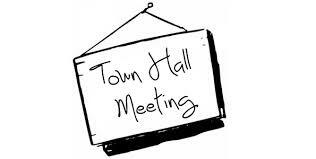 TNCS will host a Town Hall annually to provide a forum for communication of ideas and news to the TNCS community. On Tuesday, March 10th, The New Century School held its 2015 Town Hall meeting for an auditorium full of eager participants. Admissions Director and Town Hall Moderator Robin Munro said, “We are a young and very ambitious school, so yearly meetings like this are critical. We will provide an annual state of the school update, specifically the K–8th program, and a forum for families to ask questions.” Childcare with dinner and wine and hors’ d’oeuvres were offered, and questions were solicited ahead of time to allow the event speakers to shape the discussion accordingly. There was an evident unifying thread to this event: collaboration. Mrs. Munro remarked by way of introduction that “the map hasn’t been written to exactly where the school’s destination is and what the steps are along the way.” The implication is clearly that TNCS community input is not only valued and taken seriously but is also helping navigate to the destination. We are writing this map together. TNCS parents chat amongst themselves while having a little nosh prior to the start of the event. Some notable differences from last year’s Town Hall bear pointing out. The biggest is the growth and maturation that the past year has afforded TNCS. Now in its 5th year, TNCS has emerged from the growing-pains phase faced by any new school as a secure, comfortable-in-its-own skin swan. It is owning its unique identity, and that feels good. Another key difference was in the nature of the interaction between the audience of parents and the event speakers (school administrators and executive directors). Parents were encouraged to share any concerns, but criticism was given in an overwhelmingly constructive way. Parents explained their problems but helpfully offered potential solutions to these problems in the same breath. The result was a very positive and productive evening. It felt like we were all in this together, collaborating to help keep the school flourishing and moving forward. Oh, right—that is the essence of the TNCS community! Hors d’oeuvres gave attendees time to arrive at a leisurely pace, mingle, and recharge before getting down to business. In Public Health, the concept of “patient activation” measures an individual’s capacity to manage his or her own health and health care. Does she eat right and get plenty of sleep to maintain health? If he falls ill, does he have the skills to communicate effectively with a physician and to follow doctor’s orders? A correlation can be drawn in the education domain: “parent activation.” The Town Hall audience of parents was highly activated. They participate competently in the education their children are receiving at TNCS, they are knowledgeable about every aspect of their child’s school day, they purposefully sought out the school that best aligned with their own values. Their kids are so much the better off for it. This is not a way to say that TNCS students are simply academically superior. Although that is often the case, academic performance is not the key measure of “success” at TNCS; it’s so much more. Co-Founder and Executive Director Roberta Faux calls the TNCS community “like-minded,” and she expressed our shared vision beautifully in a couple of personal vignettes. She retold the story of the school’s origins (much of the audience had not heard it last year) and how quickly the 1-room Patterson Park Montessori grew into TNCS today. Then she described a lovely interaction she recently had with one of her daughters, in which her daughter asked her what gifts would she (mom) prefer had been bestowed on her daughter as a baby by a fairy godmother, a là Princess Aurora in the story of Sleeping Beauty. First of all, what an insightful and touching question from such a young child. Both this question and the answer Mrs. Faux ultimately gave exemplify what TNCS is, how it works, and why it is such a phenomenal school. “I took a step back,” she said, “and I asked myself, “as parents and educators, what do we want for our kids?” In the meantime, of course, she had answered her daughter by telling her that she likes the gifts that her daughter already exhibits, such as her kind spirit and enumerating her many other attributes. Based on the topics submitted by attendees, Ms. Munro organized the overall discussion into nine umbrella categories: Space, Curriculum, Staffing, Standardized Testing, Accreditations, Parent–Administration Organization, Scholarship Fund, Short-Term and Long-Term Plans, and Open Q&A. Although not every topic got exhaustive coverage and not necessarily in this order, the following synopsis provides a comprehensive overview of the school and its future direction. The Middle School opens in fall of 2016 and will most likely be housed in the existing Union Box space of Building North. The Co-Founders are in talks with architects and engineers to develop it as a multi-classroom space, which, if all goes planned, will be secured by August. Fall 2015 will see a mixed-age grade 4/5 classroom, mixed-age grade 2/3 classroom, and either two mixed-age K/1st classrooms or a straight K class plus one mixed-age K/1st class. Last year’s playground redesign experienced some environmental setbacks but is still going to happen in order to create a space that can work for preschool, elementary, and future middle school students. A new geo dome will be erected, and the greenhouse will be moved. Other aspects are less certain, but ideas for improvement flew about the room. Also, Head of School Alicia Danyali just announced that Friday that TNCS mom Tracey Browning has organized another High Five fundraiser at Camden Yards. Funds will go to the playground overhaul. Mrs. Danyali fielded these topics and was visibly thrilled to announce that she will be joined by an Assistant Head of School in August. This will free up much of her time to focus on exploring new approaches to inspire kids to learn and be excited about that learning. The International Baccalaureate is one such program on the horizon. “The International Baccalaureate aims to develop inquiring, knowledgeable and caring young people who help to create a better and more peaceful world through intercultural understanding and respect,” through challenging and rigorous education programs. Regarding the curriculum, questions here were very specific. Being fans already of the school day scholastic content, parents wanted to know if there will be additional after-school enrichment, sports, and musical instrument instruction. The administration heard them loud and clear—this was perhaps the primary issue of the evening. Proposed solutions will probably involve community partnerships, and this is a good thing on many levels. TNCS is committed to being a responsible and active member of the external community; partaking of community offerings is one way to honor this commitment. Discussions were already underway to expand the relationship with Coppermine Fieldhouse at DuBurns Arena, so giving more opportunities for team sports instruction and participation is a likely outgrowth. The Patterson Park pool could be used for swimming lessons, and the ice skating rink could also be used in an athletic program. Musical instrument instruction will have to be given some more thought, but some creative workarounds thrown out included inquiring about the services of Laura Norris, Director of the Baltimore Chapter of Mando for Kids, a free program that teaches Baltimore City kids ages 6 and up to play the mandolin. Mrs. Norris just happens to live down the block from TNCS and is a frequent guest performer. This video clip features all age groups she currently teaches. Developing a special offshoot for TNCS students is a distinct possibility. Such testing, albeit less pressurized than it would be in a public school setting, will also prepare students for matriculation into secondary school and beyond. Regardless, teachers are never asked to simply “teach to the test.” They have freedom to accomplish their goals how they deem suitable, based on and tailored specifically to the individuals they teach. Parents were very vocal about their willingness to help tackle existing obstacles to progress. A suggestion was made was to formalize a PTA-esque parent committee, and another to create an oversight committee to help tie individual committee threads together to more effectively communicate school changes and news. “We are open,” said Mrs. Munro. “If what you want is a formal quarterly meeting, we’ll make that happen.” Thus, again the collaborative nature of this group was felt. Though we didn’t get the chance to address this one head on, a theme throughout the discussion emerged that could serve to answer questions about how well students will be prepared for the next steps (whatever those might be) in their academic careers and lives. With the attention to whole-child development, the carefully differentiated instruction, the administration policies that ensure that TNCS doesn’t exist in a vacuum but is part of the city and state educational corps, etc. all combine to guarantee not just preparedness but that the TNCS-educated student will thrive in his or her future environs. 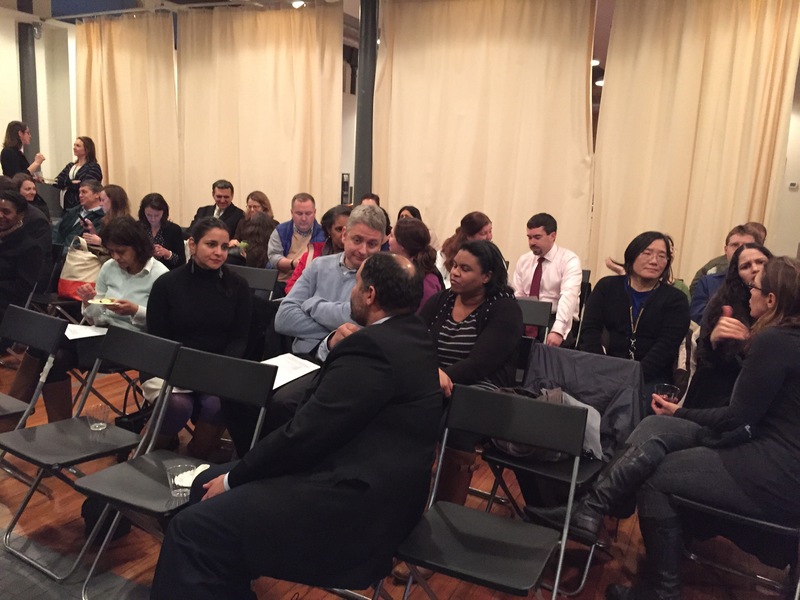 The Q&A gave TNCS administrators a clear idea of what parents feel could be done better. These issues were addressed with seriousness and respect and are of immense value to the moving the school forward. Many parents took this opportunity to praise the school and administrators for the zillion things they get right on a daily basis. See you next year, TNCS community! In the meantime, keep that valuable and much-appreciated feedback coming! News for Startalk at TNCS! 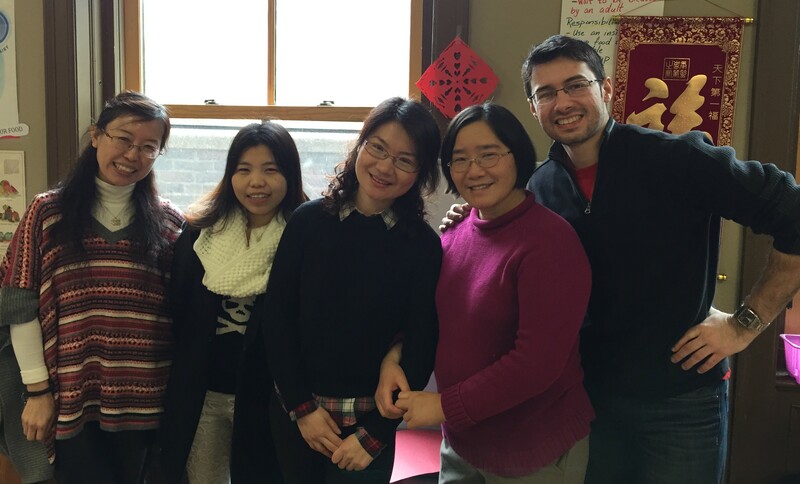 TNCS’s wonderful Chinese staff work hard to make learning Mandarin Chinese fun! Last month, The New Century School hosted its closing event for the Summer 2014 Startalk Program. That program, “Let the World Be Filled with Love,” ran for 3 weeks in the summer, but to keep participants engaged throughout the year, receptions were held at regular intervals, and a periodic newsletter kept them abreast of Startalk happenings. 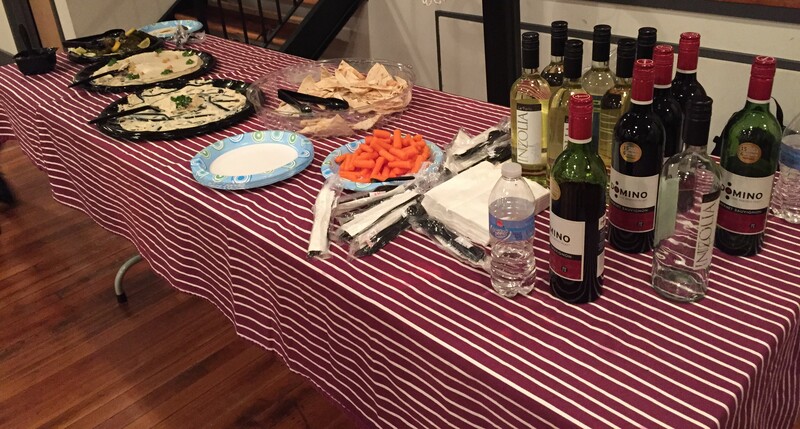 The final reception was extremely celebratory in mood, for several very good reasons. First, Startalkers enjoy getting together and chatting in Chinese! Second, the Chinese New Year was fast approaching, and that’s always exciting. Third, this reception took the form of a potluck, and the beautiful variety of dishes was delicious. 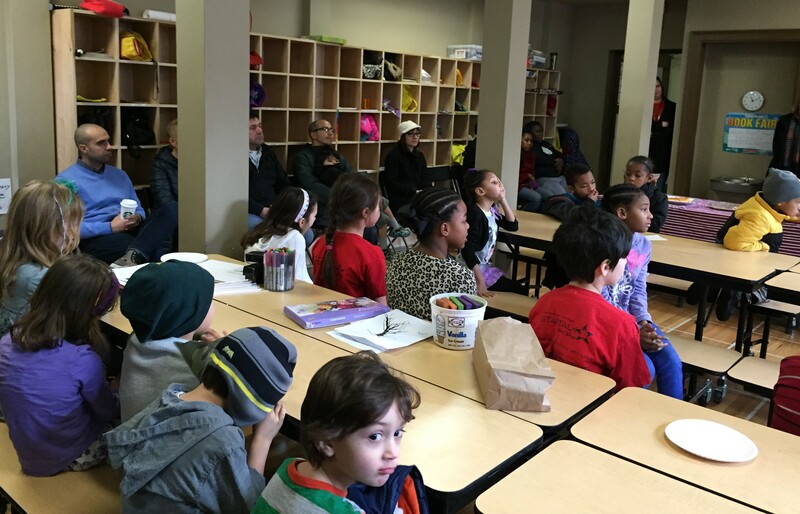 Fourth, the entire group was eagerly anticipating the results of TNCS’s 2015 grant submission, which they were days away from learning. But we’ll spare you the suspense—will TNCS be hosting Startalk this summer? 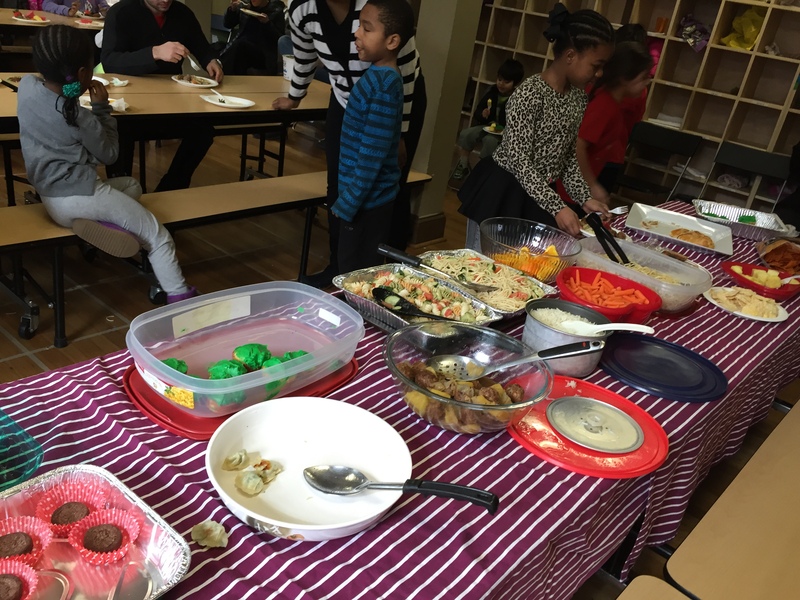 The final Startalk reception was held in TNCS’s multipurpose room, and everyone contributed a lovely dish! Yes! It is true! Shì zhēn de (是真的)! TNCS was once again awarded funding for a Startalk Summer Program! This year’s 3-week session will run from July 6–24, 2015. But back to the reception, it started off with a Chinese Immersion refresher class that focused on celebrating and welcoming the Year of the Sheep. (or Goat. Or Ram. You decide.) As students watched in complete absorption, the Chinese teachers gave a mini-lesson to get them back in the swing. Parents lining the side wall got to see first-hand how Startalk works and even picked up some Mandarin Chinese themselves! Startalk operates on the principle of doing, that is, active participation—in this case, doing is talking. Start talking. Startalk 2014 participants avidly follow Xie Laoshi and Lu Laoshi as they deliver a mini-lesson on the Chinese New Year fast approaching. Watching a lesson unfold makes it easy to see why the program is so effective. Teachers pronounce a word or phrase while demonstrating what it represents, repeat their verbalizations continuously, gesture, point, and keep talking the while. Understanding dawns quickly, and the students are expected to put it to immediate use. Another Startalk tenet is that content should be meaningful to the students. Why make them learn something they aren’t interested in applying or are unlikely to have a context in which to apply it? Thus, the day’s lesson would involve something that people everywhere would be discussing: Chinese New Year, a celebration full of color, music, firework displays, and plain fun for kids. The Chinese dragon even made an appearance, a very good omen for TNCS’s 2015 Startalk Program, “China in Baltimore”! Very special thank-yous go to Startalk Director and Head of Mandarin Chinese Language at TNCS Xie Laoshi, her devoted assistant Lu Laoshi, and to the other caring and committed Startalk staff members. They worked tirelessly to make Startalk 2014 a monumental success and to land the 2015 grant ensuring that TNCS remains at the forefront of Mandarin Chinese instruction in Baltimore. We look forward to an amazing Startalk 2015! Would you like to learn more about Startalk at TNCS? Here is a link to download the most recent continuing education newsletter in pdf format: Start Talking v1n3. It provides recommendations for practice apps and websites to supplement the Chinese stories and idioms that are also included.